Carolina Breeze will lull you into slowing down, filling your lungs with fresh ocean air and your eyes with the endless vista of seaside beauty. Kick off your shoes and relax in your private HOT TUB or doze in the sun-kissed warmth of your decks from the porch swing, looking out towards the sea, with the cries of seabirds as a lullaby. Float in your LARGE PRIVATE POOL after enjoying a ride on one of the two beach cruiser bicycles. An 11-mile paved multi-use path is directly across from the house. Let the gentle breezes take you to nearby shopping, restaurants and historic landmarks. With the beach access, grocery store, restaurants, art galleries and shops all within easy walking distance, there's almost no need to use your car during your stay. Just let the charm of Carolina Breeze thoroughly refresh your mind and body. Located just across the beach road from the gorgeous Atlantic you will enjoy breathtaking sunrises and sunsets from the four decks. With the direct beach access, just pick up your beach chairs and toys and go to the beach - no worries if the kids forget something - it's a two minute walk back to the house. You also will enjoy new appliances, multiple TV's (42" flat-screen in the living room), DVD players and new furniture. Enjoy the provided DVDs and books. For the kids, there are board games, and a basketball goal. Best of all, with the fully fenced back yard, you can bring the family pet (dogs only) on vacation with you! From the huge living area to the beautifully outfitted bedrooms, no shell has been unturned when it comes to creating the perfect accommodations for enjoying the Outer Banks lifestyle. 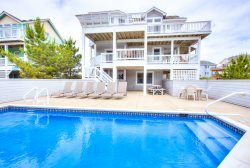 After a stay in this wonderful beach home, you'll know that nothing could be finer than to be in Carolina . . . Breeze! Ground-Level: Washer Dryer/Rec Room with bikes and beach chairs. We had an amazing time this year in the OBX! Loved Carolina Breeze! The layout of the house was perfect. The location to the beach, shopping, dining and things to do was perfect! The furnishings were comfortable and we had everything we needed in the kitchen. We absolutely loved having the fully fenced in yard for our dog to run, play and just hang out while we laid by the pool. My husband and I have been coming to the OBX for 10 years and we finally found our forever rental! The only 2 recommendations I would make is update/upgrade the beds to something a little more comfortable and have a screen for the sliding glass door that is in the king room (going out to hot tub). There were a few days it was really nice out and it would've been nice to have the sliding glass door open to allow the fresh air and breeze to come in. Otherwise, we love the house and can't wait till our stay next year! Great house, fully equipped. We enjoyed the pool and our dog enjoyed the fenced yard. We loved the living room and dinning room space. A great time was had by all.